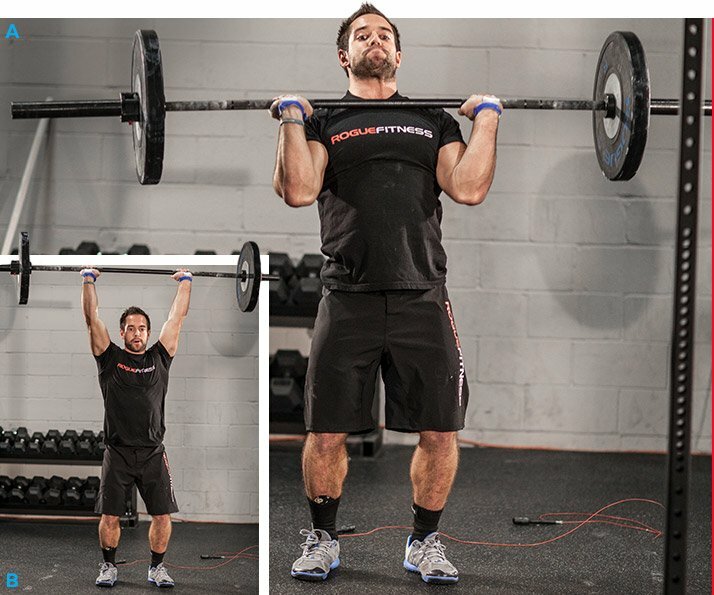 Doing CrossFit with Rich Froning is like playing hoops with LeBron or golf with Tiger. Let's see if you can hang! I've never competed as a bodybuilder, but I trained like a bodybuilder for many years. I started doing CrossFit as a supplement to my regular training. Then, I fell in love with it and I haven't looked back! You don't have to be a CrossFit competitor to do CrossFit-style workouts. If you're a bodybuilder, physique athlete, or even someone new to fitness, you can use a CrossFit workout as your cardio day, or you can add the movements to your normal routine for a new challenge. If you want to add a CrossFit workout to your program, try this one. It's a quick, fast burner that will improve your cardiovascular fitness, muscular endurance, work capacity, and more. This workout will also help your grip and coordination. You might even learn some new movements! This workout is designed for anyone. It's a CrossFit-inspired metabolic-conditioning circuit. There's a push, a pull, and a cardio element. As soon as your push gets uncomfortable, move to the pull. 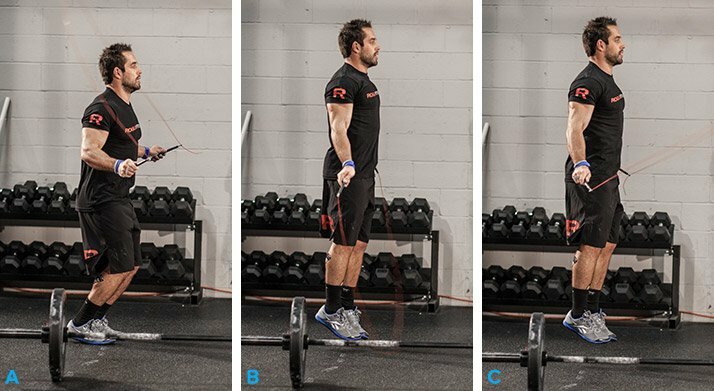 When the pull becomes an issue, move to the jump rope. Jumping rope will make you tired and challenge your forearms just enough to make the other two movements a bit harder. The workout isn't fancy: You don't need much equipment, and you can do it in less than 10 minutes. This workout is done for time. Complete all the work as quickly and efficiently as possible. There are no programmed rest periods; the only breaks you get are during transitions from movement to movement. You'll begin with shoulder to overhead (STO). After you complete 15 reps, you'll go directly to pull-ups (PU) and do 15 reps. After you're done with pull-ups, you'll do 30 double-unders (DU).When you're done with the DUs, return to STO and do 12 reps. Then you'll do 12 reps of PUs and another 30 reps of DUs. You'll keep repeating that pattern. The STO and PUs will go down by three reps each set, while the double-unders remain constant at 30 reps. The point of this movement is to get the barbell from your shoulders to over your head. Your arms must be completely locked out and the bar must end up over the center of your body. There are three ways to do STO, which I'll go over below. A pull-up rep counts when your chin is above the bar. 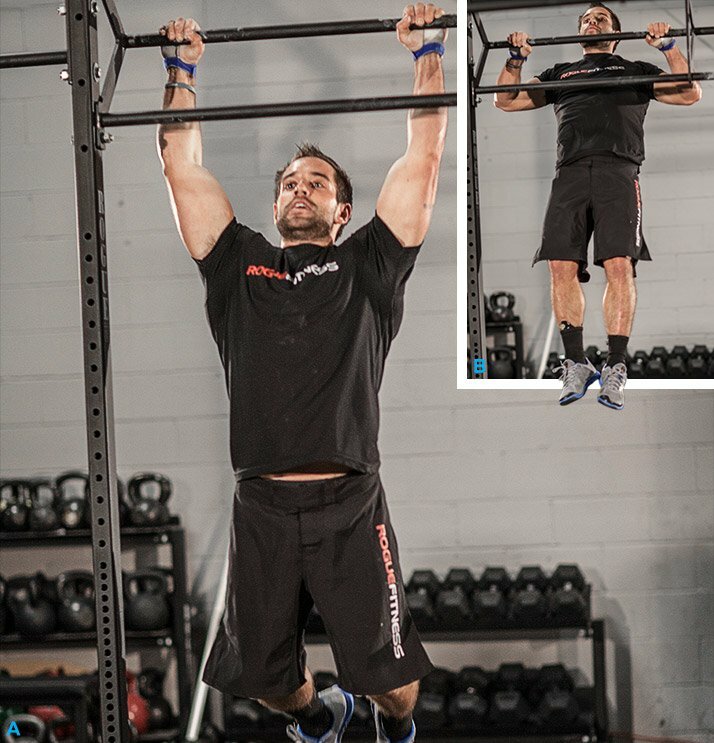 There are multiple ways to do pull-ups for a CrossFit workout. A lot of people are going to hate these. Yes, they're difficult. The rope goes under you twice in a single jump. The trick is to keep your hands slightly in front of you and close together. The wider your hands are and the farther they are away from your body, the shorter the rope is. That's when you start smacking yourself in the shins. It might take some work to get the timing right. One of the awesome things about CrossFit is that it's infinitely scalable. Meaning, if you can't do a movement as prescribed, then you can make it less difficult. If you can't lift the prescribed weight, or aren't coordinated enough for a particular move, there's always another option. You can go from an elite level to a very basic level by making a few simple changes. For this workout, your goal is to finish somewhere between 5 and 7 minutes. So, scale the moves and weight appropriately. If your weight is so heavy that you are taking more than 10 minutes to finish, you're missing the point of the workout. If, however, the weight or the movement is scaled back too far, then you're not going to challenge yourself like you should. For this movement, your feet should be right underneath your hips, your hands just outside the shoulders. The bar will rest on your shoulders. Keep your elbows up slightly and in front of the bar. If your elbows are behind the bar, then you're pushing the bar out instead of up. We want the bar to go straight up and straight down. Press the bar up and tuck your chin. Make sure you use active shoulders at the top, pulling your ribcage down, and tightening your core to protect your spine. You should feel good support all the way through the movement. Bring the bar down in the same path as it went up. The more straight up and down you move the bar, the more efficient the movement is, the better it is, and the safer it is. A push press is similar to the shoulder press, but we're going to add some velocity. Once you get tired, you're going to want to save your shoulders and use your legs. Begin the same way you would with a shoulder press, except this time, you'll do a quick dip with your knees. Use that momentum from your hips to drive the bar up. Don't dip your chest forward, because then the bar will go out instead of up. Keep the bar over the center of your mass. The push jerk is probably the most efficient movement, but it also takes a little more coordination and uses the most musculature. You'll do the same dip as the push press and same press as the shoulder press, but you're going to retreat slightly under the bar. So, your legs should be bent and the bar will be over your head. In order for the rep to be complete, your legs must be locked, and your shoulders and arms fully extended. If you widen your feet on the jump, make sure you bring them back in at the top of the rep.
Everybody knows how to do a pull-up. You pull up! Your chin should end up all the way over the bar. Keep your shoulders active at the bottom; don't just let yourself fall down or let the shoulders fall out of the joint. The problem with doing strict pull-ups during a workout like this is that they're not very fast or efficient. There are ways to add speed. Add velocity to the pull-up by using the kip. A lot of people think this is a leg-based movement. In reality, it starts in the core. I've heard negative comments about people kipping, like, "Oh, they're just flailing around on the pull-up bar." The whole point of the kip is to do more work in less time. Your chin still goes over the bar; your shoulders are still active. This type of pull-up is a little faster than the kip. You can get more work done in less time. The essentials, however, are the same: your chin is above the bar, and your shoulders are still active. Butterfly kips take some practice; don't stress too much if you don't get them right away. If you can't do any of these options, you can still do the workout. Use an assisted pull-up machine, use a band, do jumping pull-ups from a box, or do inverted rows. Scale according to your skill level. If you can't do double-unders, then do single-unders. If you choose to just do singles, double the amount of jumps. So, instead of 30, do 60. If you can't do 5-10 double-unders without whipping yourself, then do singles. The jump-rope portion is supposed to challenge your cardio, so if you're stopping every 10 seconds to reset the rope, the workout will last longer than it should. If using a jump rope is out of the question, you can jump on and off a plate. You can also jump laterally over a barbell. For STO, I use 135 pounds. That's what would probably be prescribed for men during the Games. Women would probably be prescribed to use 95 pounds. However, just like the movements, weight is scalable. Use a weight that's challenging, but not so challenging that you can't complete the workout quickly. If you have a shoulder injury, or don't have the strength to even do a barbell, you can go as low as using a PVC pipe. Check Out BSN's complete supplement lineup! Go Now!